I spent the day at Harding University (A Church of Christ affiliated school) in Searcy, Arkansas and gave a talk to the students/faculty in the evening about my book and atheism in general. Going to a coffee shop after the event with several Harding students and a couple fellow atheists gave us all a wonderful opportunity to talk about our beliefs in a non-threatening, really-fun, why-can’t-this-happen-more-often sort of way. In my on-campus hotel room last night, I realized that there was a filter blocking out certain websites… one guilty pleasure of mine is to read the Missed Connections section on Craigslist. What about Rants and Raves? Blocked. Same reason. Men seeking men? Really blocked. Sean Hannity‘s conservative dating site, Hannidate? Not blocked. 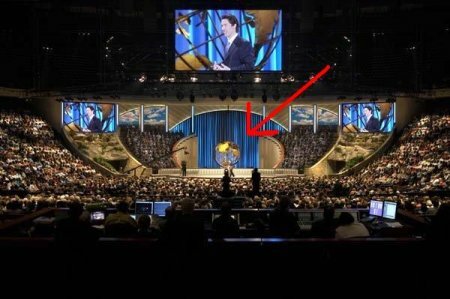 You know that spinning globe that is part of the backdrop at Joel Osteen‘s Lakewood Church…? The “old” globe now resides in the on-campus hotel’s foyer! It’s like Joel was speaking directly to me… Clearly, a sign of good things. I had a chance to visit the Bill Clinton Presidential Library. First thing to note? No mention of Monica Lewinsky (that I saw…) and only a brief mention of his impeachment hearing. Tomorrow, the Interfaith Youth Core conference. For now, a short nap. Thanks to Brett, Patrick, Tessa, Emily, Andrea, John, Jacob, Dr. Hopper, Professor Monte Cox, and the several others students and faculty members who helped make this event possible! Mommy, Where do Morals Come From? Come See Me at Harding University Tonight! October 29, 2007 He Lives! I am a student at Harding University, but was unable to attend your talk. My teacher for international relations mentioned your talk and we had a small discussion on this during class. After hearing the basic story of your selling of your “soul” on Ebay, I have one question for you: What is the Seattle minister’s cut from the book sales? Surely he gets something. Hemant: There is a brief (albeit short) mention of Monica Lewinski and the impeachment at the Clinton library. It’s there — but you gotta look for it. Sorry, I don’t quite follow. Why is this ironic? I think Hemant finds it ironic because of the last part (“listen to God in the silence of your heart”) given the recent book of her letters, released after her death by the Vatican, that shows she felt God was silent for the last decades of her life. I’m so glad it went well for you! I hope this happens more often! Hemant, you’re becoming the international ambassador for atheism! Go Hemant, go Hemant, go Hemant, . . .
We both wrote our own books, so there isn’t any “profit-sharing” or anything like that. I think we were both able to make the best out of our shared experience and that dialogue is still continuing for both of us. It’s exciting that this story has allowed us both to pursue some of our shared goals. You might also notice that Hemant is kind enough to promote Jim’s book (“Jim & Casper Go to Church”) on his sidebar as well. Both books are excellent and you should definitely read them both. If nothing else, they demonstrate that no two atheists are alike and should not be stereotyped as a group. Hehmant, thank you for your presentation at HU last night. I really enjoyed it and learned some very interesting things. (If you are interested you can read more on my blog). I know you were put on the spot a couple of times and I felt for you even though I agreed with where the questions were coming from. I am sure that if you put me in a room full of atheist asking me the hard questions I’d have a really hard time! I’d thought I’d ask some questions, maybe you have addressed them somewhere, or maybe you might think about addressing them, or directing me to where it is talked about. The last one is more a questions specifically for you and your experice going to Christian churches. 1.What makes a human, human? What makes us different from other animals? Why do we hope, worry about love? Why do we care about stuff? Why are we so different from every other living being? 2.What did you learn of new, did anything surprise you, strike you as odd and different from what you previously understood, about Jesus Christ? Side note: About Mother Theresa, it actually encouraged me to find out that she struggled with the ‘dark nights of the soul,’ that faith and knowing, in our minds or in our hearts for sure, is not the same thing. I still hope to emulate her and knowing that she struggled with faith encourages me to carry on in spite of my doubts- and strangely it works against them without even trying. I do find it hilarious that that Hannity’s site was not blocked. I’m just catching up and read your post about Shaadi.com. That was kinda’ interesting. I hope you find a nice atheist girl soon! Atheist and Christianity actually have many similarities in that they both are belief systems (Dr. Cox thanked him for acknowledging that- it makes dialogs easier when they admit that they “believe” there is NO God and that this belief affects most if not all of their lives in one way or another, just like my belief that there IS God, and one only, does). Hemant, did you actually say any of that? Miriam’s pretty adamant that atheists believe there is no God, through ignorance or delusion, but claiming you said so is a bit different. I’m not hemant, but I’d like to take a wack at answering this from my perspective. 1.What makes a human, human? What makes us different from other animals? I’d say that we aren’t very much different from other animals… just better at changing our environment and thinking about ourselves.. and communicating those thoughts. What makes a human human? Opposable thumbs, big brains and hands freed from walking on them. You’re asking the questions that you value, as well you should as you are a human. But you’re asking them from the perspective of a human, which means you’re slightly biased in what you consider to be important aspects of a valuable life. With that in mind, here are my answers. Why do we hope, worry about love? Because we are social creatures. Just like all other social animals, we bond emotionally to other members of our group. Why do we care about stuff? If you were the type of creature who didn’t care about stuff, you’d ask the opposite question: “Why are we so carefree?” Both questions are merely statements of things you like. I’m glad you “care about stuff”. So does my cat. Why are we so different from every other living being? Define “so different.” Biologically speaking, we really, really aren’t. Socially and emotionally we really, really aren’t. Anyone with a pet can tell you that animals have a tremendous capacity for love, just as humans do. Yeah, Miriam is probably extrapolating here. Hemant did say atheism is a worldview. He did not say it was a religion per se, or that he “believes there is NO God,” both of which statements he’d probably disagree with. Cut her some slack. Most people, Christian or otherwise, have never heard someone explain the difference between lack of belief in God and belief that there is no God. I know it’s a big deal to atheists, and it is an important distinction, but for someone whose time is not consumed with the kind of discussions we have here on this blog, it is a rather fine distinction, and not one that the uninitiated are likely to pick up on just listening to a presentation on stage. I am sorry Hemant that I misrepresented what you said. I did edit my post. I did not know there was a difference between the two phrases (not believing in God vs believing there is no God). Mike C said it right about me: I am pretty ignorant about the atheist world view and what kind of nuances words have for them. It was perhaps the first time I really heard the point of view of an atheist about the very same topic. In fact I don’t get to speak very often to anyone who is atheist or even agnostic these days. Saimang, thanks for sharing your thoughts and answering my question. These last few days I have been getting plenty of comments to make my brain work hard! Hemant did say atheism is a worldview. Disappointing, a bit too friendly I think. I don’t think Hemant has ever said that on this blog. With good reason, we have the tar and feathers ready. It’s absurd to call atheism a world view. Afairism isn’t a world view and I’m as much lacking in belief of fairies as I am gods. Do you believe in teapots orbiting jupiter? The flying spaghetti monster? Are these absurd questions to you? They are absurd as the one about god to me. People understand the difference between lacking belief and unbelief. They may never have had it explained to them without taking a course on philosophy, but people already use the idea in their heads. I was an atheist before I had any concept of god. You don’t have to believe that leprechauns do not exist to not believe they do, a lack of belief is the default position when presented with no evidence either way. There are secular (without god) world views, some incompatible with most common definitions of gods, some with no say on the matter at all. Many atheists have been fighting a long time to stop christians from continuously misrepresenting our views on the subject by claiming atheism is a world view. We don’t think there should be a label “atheist”, there are no afairists because most people don’t believe in fairies.